We recently had the privilege of testing out Mack’s big Super-Liner in the application the famous Dog brand is promoting – east coast linehaul. The rig we drove was powered by the Super-Liner’s 16-litre MP10 engine, putting out 600hp (441kW) with 2800Nm of torque, and matched to the 12-speed m-Drive AMT (automated manual transmission). The 5.35m wheelbase unit with 1,600 litres of fuel capacity was hooked up to a set of tautliner B-doubles carrying concrete blocks, with the entire combination grossing 58 tonnes. This configuration is capable of holding 34 pallets in the 26 metre B-double envelope. The compromise is a 36 inch (915mm) sleeper. We took the Super-Liner on a NSW run from Albury to Wagga on the Olympic Way; from Wagga to near Tarcutta on the Sturt Highway; and then on to Sydney along the Hume Freeway. Just as Mack claims, the sync between the engine and the transmission is seamless. You just don’t notice any bad gear changes from the m-Drive AMT box. There’s plenty of grunt of course. We slowed down to 35km/h up Wagga Hill but if you want to go faster you can always boost the power to 685 horses. The bonnet gives a feeling of security but slopes down well, thanks to the splayed chassis rails at the front, allowing the engine to sit lower than in Super-Liners of old. The standout feature in my book is comfort while retaining good road feel, thanks in no small part to the relatively long wheelbase, air cab supports and excellent Isri seat. There are a couple of very rough sections on the Olympic Way, but the big Super-Liner handled the sharp undulations with ease. Most importantly, it held its line perfectly as we passed other trucks on particularly bad stretches of single-lane, without any wallow or sway. There’s no need to fight the steering wheel. Out on the freeway, you could be in your lounge chair at home. It’s remarkably quiet inside the cab, and the radio covered the sound of a couple of minor squeaks and rattles the truck has developed after 270,000 k’s as a fleet seed truck. I took the Super-Liner into the Shell at Sutton Forest, knowing there’s a tight little roundabout involved. The truck passed the vision and manoeuvrability test well; and then reversed into a parking bay as well as can be expected in a bonneted truck. 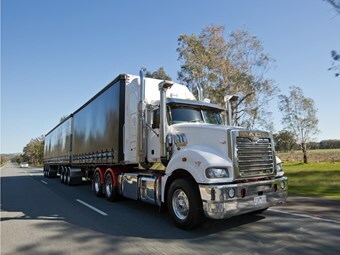 There’s one potentially big problem with the version of Super-Liner we drove – you can’t stand up in it, and that could be an issue for someone who spends all week or longer in their truck. Mack says a high-rise walk-through cab is under evaluation, and it seems inevitable they will have to offer one for 34-pallet work sooner or later: after all, it’s hard to think of any cab-over or bonneted competitor that doesn’t. I have another quibble too: to take the truck off cruise control, you have to either take your eyes off the road to turn the dash button off – which means re-setting all over again – or touch the brakes, which you don’t want to do on the crest of a hill with some clown right on your tail. In contrast, the Volvo stable-mate has an engine brake stalk to the right of the steering wheel, which, without having to look, you can pull down to knock yourself out of cruise control. Check out our feature on the 34-pallet Mack Super-Liner in the September issue of ATN, and subscribe here to secure your copy.